It’s one of those things that every Woocommerce developer and store manager just can’t fathom. I suppose it’s because there are so many shipping companies out there that it would be next to impossible to include this feature out of the box. Why they don’t include it in the shipping plugins, though, well, more on that later. While you can’t even print a simple packing slip / label with Woocommerce right out of the box, there is a free plugin that makes this easy. It’s called WooCommerce Print Invoice & Delivery Note, and it’s available for free from WordPress.org. To do this, first login to WordPress and head to Plugins > Add New to install the plugin. It’s pretty simple to install a plugin, but if you need help, here’s how to install a WordPress plugin. 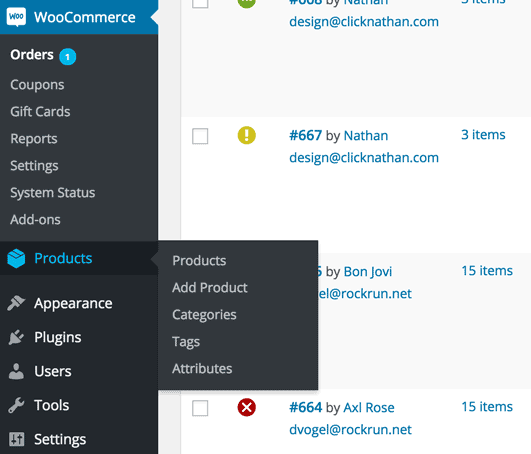 Once you’ve installed and activated it, go to the Orders page under Woocommerce in WP Admin. Go to Woocommerce > Orders to view all of your orders. A single order from the Woocommerce Orders page. Note the four icons under the Actions header. The checkmark will mark an order as complete. The eyeball lets you view details about the order. These are the default actions that come with Woocommerce. Our plugin added the other two buttons. Both of them allow you to print out a packing invoice. This isn’t a shipping label, mind you, but it’s one of two main ingredients people typically want when processing an order. For this, you’re going to likely need to shell out some money or do some experimentation. For each different shipping provider (ie, USPS, UPS, FedEx, etc.) there is a different process. I recommend only using one shipping provider, particularly if you’re a smaller scale business, because it simplifies not only this process, but how you ship things in general. But those just get you integrated with USPS rates, so you can charge your customers the appropriate amount. I think it’s a bit of a rip off that the official Woocommerce plugin doesn’t also include printing shipping labels, but it doesn’t, so you can integrate with Stamps.com for even more additional costs but via an official Woocommerce route, or use a 3rd party plugin like this one. I mentioned the free USPS shipping plugin from WordPress.org, too, which has a “Pro” version that is available from Wooforce for $69 / year, too. The pro version does include printing labels, as well as updating tracking info in your Woocommerce install, too. While I tend to think this is the best solution as you get the USPS integration and label printing, plus the cool tracking stuff, all in one, it’s not the right solution for everyone. Much of this depends on what you do outside of WordPress. How you want to handle actually packing boxes, if the carrier will be coming to you or you to them, and how easy you want it all to be. Have questions? Just ask! Got a plugin suggestion for Woocommerce? I’m always looking for better solutions, just leave a note in the comments below! What do you think of Shipstation or Shipping Easy as plugins for printing shipping labels? This is the biggest downside of using wordpress. With a PayPal “Buy Now” button, everything including shipping and tracking is FREE. You just pay the discounted postage rates. Haven’t tried those yet, Maury. Have you? You can still use PayPal as your checkout with Woocommerce, though. Checkout postmen.com. Its free till the end of 2017. Its still in the beta stages and doesn’t have a lot of features, but it is usable. You can buy and print postage directly from them. And they support almost all the carriers. I am using the free version for now, and was attempting to do a manual order and then calculate shipping. I didn’t see an option to due so on the manual order page. IS this possible? If it’s not I assume I can create the shopping cart as that customer and see the shipping rates by adding their zip code and then adding a manual shipping cost line item, but it would be great to have USPS integration on the manual order page as well. I’m not entirely sure, Tim, sorry. Maybe contact their support guys. I’ve been using this, but i can find a label sheet to actually print it out on too! Do you have any idea where i can find them? I like the article. It seems that woocommerce has changed its look a little bit since this time, I can’t seem to find a way to cancel a label once it’s been printed. If you have any ideas I’d appreciate it!